Over a hundred years ago this area was homesteaded by a pioneering area family. They built their original home, farmed and provided produce for the citizens of Leavenworth. From the ranch, family members often explored up and onto distant Round Top Mountain, a snow-cone shaped mountain visible from miles in every direction. Family descendants recently built Round Top Ranch lodge as a private place for family and friends. Now its available for vacation rental to guests from around the world. A secluded riverside retreat awaits you at Round Top Ranch, the only house on this side of the creek with no immediate neighbors - it's perfect for whatever your dream getaway may be. The first floor features floor to ceiling windows for tons of sunlight to be let in. Don't miss the light bouncing off the green Nason Creek just a few dozen feet away. The stream is visible from many areas of the house so you feel just like the water flows around the house. The open floor plan with huge wood beams allows you to feel at one with nature as you recline in the leather couches. There are decks both off of the living area and the kitchen, making it the perfect sun soaking spot. The master bedroom, also on the first floor, provides privacy for mom and dad. The room is complete with a TV, queen sized bed, and a private entrance. The top floor is a loft that hangs over the living room. It features two queens and two full sized beds, sleeping a maximum of ten. That's the whole family! You can step back in time, but with all the modern comforts of home. In fact, Round Top Ranch also has stables so you can bring your horse and ride deep into the forest, even up and onto Round Top Mountain. With 3 corrals, the first at 1/8 acre, the second at 1/4 acre and the third at 1/2 acre in size, Round top Ranch is truly a special place. Thinking about booking with us here in Coles Corner? If so, you won't regret it. We're Northwest of downtown Leavenworth where the spirited Bavarian Village awaits. We're also a few minutes west of the Village of Plain where endless recreational adventures happen. We're just minutes from Stevens Pass where skiing and snow shoeing is popular during the Winter months. Take a step further and enjoy ice fishing and skating. During the warmer Summer months, there are trail heads to hike and tons of wild life watching. Make your way to downtown Leavenworth where events and activities never end. Enjoy Oktoberfest in the fall or Maifest in the Spring. The colder months means Christmas caroling and tree lighting events. Here at Leavenworth Getaways Vacation Rentals, we vow to make booking with us simple and exciting. We know that booking a rental property home for your vacation can be unfamiliar territory for some, while others know their way around it. Because we know this, we ensure that each of our properties are up to high quality standards. About Us We just love this house. We bought it for family, friends and fun. Yes we spend time here but we also enjoy having other folks move on in and settle on it. With luck they'll all get to spend quality time here with their family and friends having fun. And now you are invited. Look at the calendar, call if you have questions or just select your dates and book online. We've taken care to outfit the home nicely and put in the kinds of furnishings and fixtures that make it comfortable and convenient. The home is handy and easy to get to. It will be clean and well maintained. And ready for your arrival. Use of this website is open to everyone. In addition to information about our home, we like to include news, blogs and other information you will need to travel to our area and sample everything it has to offer. For normal assistance with this website, we prefer that you contact us by email but you may telephone us for more urgent matters. Inquiry volume varies so please allow up to several business days for response. In case of emergency you may fax us at the fax number below. Round Top is a fantastic property. Close enough to explore Leavenworth and view the millions of holiday lights that adorn the village this time of year. Lots of snow @ Round Top when we arrived for a picture postcard winter scene, then wind storm, some melt and sun! The cabin is fantastic. The seven of us had lots of room to spread out and join together for meals, games and laughter around the fire. Hot tub was a major factor in choosing Round Top and it truly played a part in our overall relaxation. Very comfortable beds, the kitchen and cabin had everything our family could ask for. We made all of our meals at the cabin. Everything was perfect. The housekeepers did a great job as the cabin was very clean. Simon, our contact during our stay, was very helpful and polite with the one question we had upon our arrival. Penny, our host, was great in guiding me through this first Airbnb experience. 5 stars! The Round top Ranch was awesome. My wife and I were very comfortable in the master bedroom. 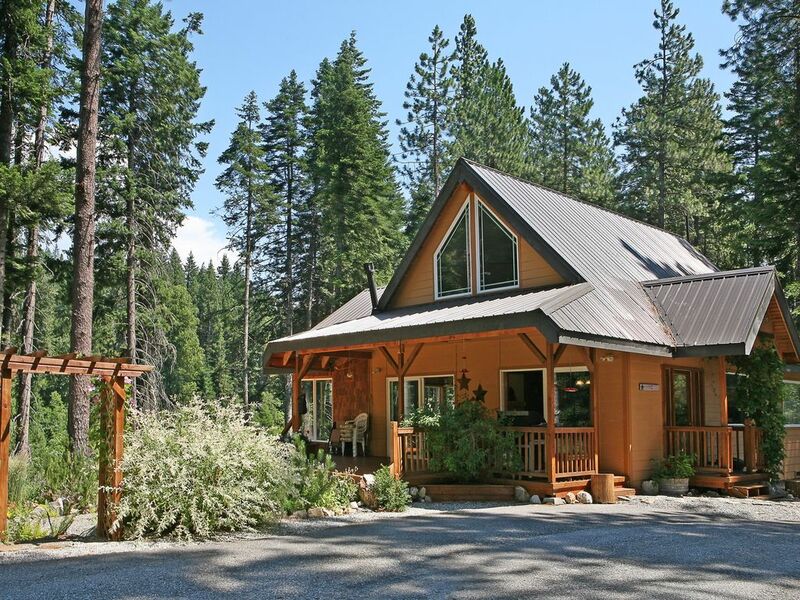 The property is private and the cabin has lots of windows for natural light and scenic views. A new covered hot tub was a great touch as well. We would happily rent again. We really enjoyed the cute cabin, beautiful setting, property and views. The kitchen is fully stocked. Our group had a great stay at Round Top Ranch (for the second time because we loved it so much the first time!). Highlights were the hot tub, river floating (you have the entire side of the creek), and the spaciousness of the place. Penny was great with communication beforehand and answered all our questions. We would definitely stay here a third time! This is a great spot for a family or group of friends to stay for some time away from the city. Close enough to both Stevens Pass ski area and Leavenworth and right on the river, this is a great launching pad for your weekend adventures in summer or winter. This was a great place for a quiet, secluded weekend. The pictures do not do it justice! It's a large cabin with plenty of places to sleep. The waterfront access is great for when it's hot and the hot tub is a nice addition for when it's cooler at night. It is a remote check-in through the lodging company. They are friendly and communicate effectively. Thanks for having us! Shopping, boating, shelling, wildlife viewing, miniature golf, kayaking, cross country skiing, snowmobiling, rock climbing.